yes ... new size, a prototype ordered by Marc Blanc for wave riding on hydrofoil (he uses surf/SUP foil wings). for some more pictures and info. Finally got out on the 8.5 in some appropriate winds late Saturday. Was blowing 10-15mph, little on the light side. Launched straight downwind without issue. I was on the Levitaz Cruizer foil with LF Galaxy board. This was my first ever ride with a foil kite on the water. I had about 40 minutes or so before dark in waning winds. Setup was a 55cm bar and 20m lines. Diving the kite did not give enough power to get me going but I'm not an expert foiler, up foiling and riding but no transitions. I could loop the kite and that would get the kite moving fast to give enough power to get me going, then cruize! I managed to put it on the water 2 or 3 times (pilot error) but no drama, back in the air almost immediately. I think it'll take a few sessions to dial things in, was oversheeting the kite at times, may need to tune my bar a bit. Landed the kite easily using the hand brake and had a helper to grab it. Biggest issue right now is finding wind (enough but not too much) to ride in. I'm a bit timid to take this out in over 20 with the launch I'm at. Rode my 9m 3 strut wave kite yesterday an should have been on a smaller kite, was not comfortable putting up the 8.5. I think maybe with more experience it would be ok. Debating grabbing another CA Wave. What is the sweet spot for these kites on the foil? Is the 4.5 too big a jump? Hi Tony, I am now travelling with 4.5 + 8.5 as a complement to paddle surfing (same board for surfing and kting). A friend of mine (75 kg) on hydrofoil with a large front wing has now switched from CA Wave 3 + 6.5 to 4.5 + 8.5. I have not tested the whole windrange of the 8.5 (my friend as well) but I think it should work. Wave 4.5: low-end steady 13 knots / High-end steady 25 knots (he can ride at 30 but tacks and jibes can be difficult). Steady means that there can be lulls or gusts around the value. For the high-end, with that quiver, the 2.3m would be more appropriate than the 3m for a 3 kites quiver. He has also a pulsion S 12 for the light wind conditions (the very first prototype that Benoît Tremblay had with him when he visited us in South of France last sping) . That's good information. Seems to be a nice overlap between the 8.5 and the 4.5. I'm just under 80kg and riding the Levitaz Cruizer wing mostly. It'll go pretty early but not as much as a big surf wing. I swapped with my buddy who was on the LF Impulse (like the Cloud 9 S24) and it definitely goes earlier at a slower speed. I'd guess my low end is a knot or two higher. Can you guys explain the deflate vent to a novice? I open the velcro on the trailing edge and pull out the vent. The vent also has velcro strips on the end, what is their purpose? Do I need to do anything with that velcro? Hoping for some good foiling winds this weekend. Function 1: when you deflate the kite, you take the sock out (just like in the above picture) by opening both velcros. 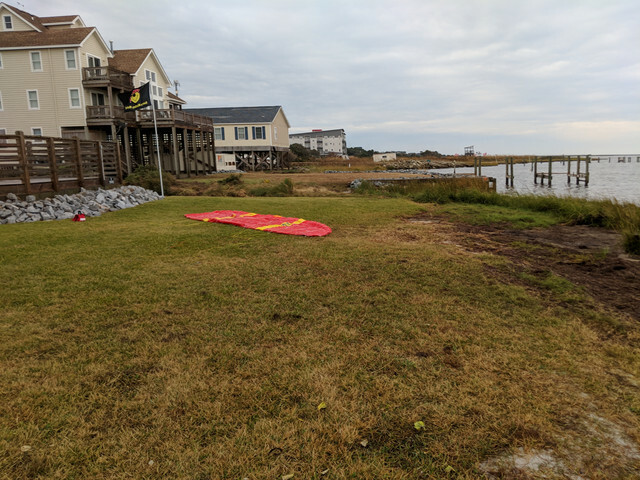 You grap one of the tip (usually the up wind tip while you have the wind on your back and the kite is totally downwind from one tip to the other) and you put it over the tip which is on the ground. You can then start rolling the kite and the sock helps you emptying the air in the kite because it is in the middle and you roll the kite towards the middle. Function 2: It helps to manage over-pressure in the kite if you crash the kite at high speed on the water or on the ground. The sock open and gets the over-pressure. The velcro inside which has to be closed when you ride allows you to continue to ride and keep the air pressure in the kite if you crash it and the sock deploys --if there were no second velcro inside, the air would get out and you would loose pressure. Several riders have tested (against their will) the sock and all of them say that if the sock deploy there is no problem to fly the kite. You can go back to shore without any problem. some riders have been experimenting with this and folding the sock as above seems to be the current consensus for hydrofoil riders (crashes are usually at higher speed and more "intense" than while riding a strapless surfboard in waves). It is helpful for snowkiting too as the kite crashes on hard ground. The nice thing with the sock is that it is like a "fuse" but you can still ride (thanks to the second velcro) if it blows. Deflate open velcro on middle of trailing edge and pull out sock. Then open white velcro on sock. Roll up the kite and it easily deflates in this state. Prior to flying the kite make sure that the white velcro on the sock is closed and the sock is inserted into the trailing edge opening with the trailing edge velcro closed. with the trailing edge velcro closed. you can close it half-way (+fold the sock as in the picture) with the technique I presented above if you want the sock to deploy easily. Good ride! (I am stuck on land right now due to a lot of work and too many hours from the waves + no car ... hopefully I should go do some testing in a couple of weeks ... summer is coming here). Should be stronger and lighter.